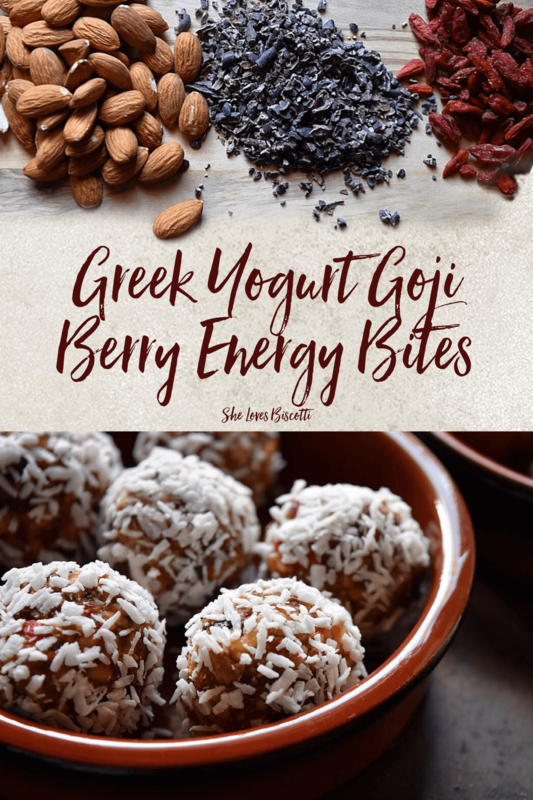 Greek Yogurt Goji Berry Almond Date Energy Bites – a healthy snack guaranteed to satisfy the munchies, no matter when that feeling hits! Be prepared. No one is immune to the munchies -whether you experience them in the middle of the afternoon or in the middle of the night. Perhaps you get that feeling as soon as you wake up in the morning and you don’t always have the time to make yourself a proper breakfast. Instead of relying on highly processed commercial foods, try these little bites to tie you over to your next meal. 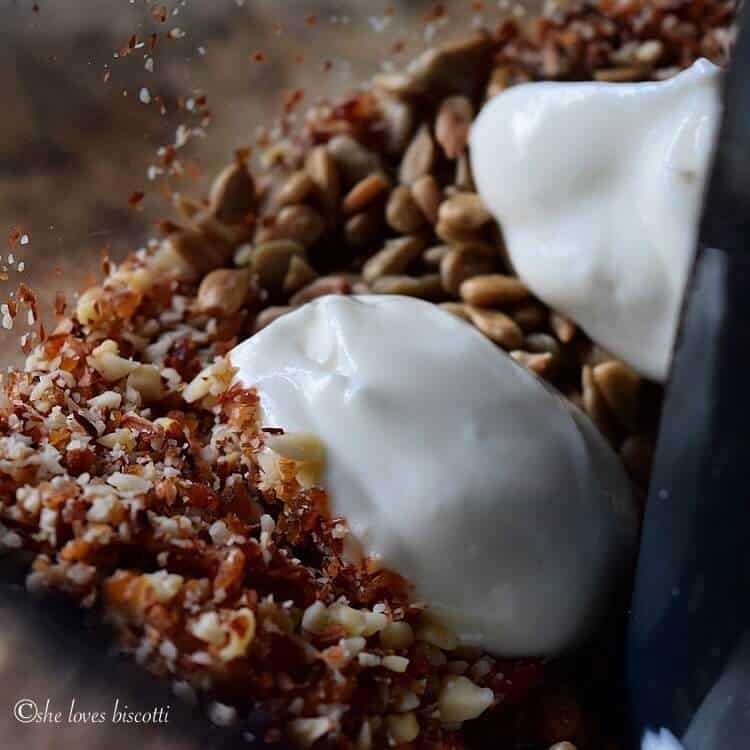 Let’s take a closer look at just a few of the wholesome ingredients which are part of these Greek Yogurt Goji Berry Almond Date Energy Bites. Almonds: As you’ve probably heard, almonds are truly nutritional powerhouses, providing you with some important anti-oxidants and nutrients. Almonds are also high in protein and fiber, which can contribute to reducing your overall daily food intake. This is always beneficial if you are trying to maintain a healthy weight. Be mindful of the portion size – a one ounce serving is equivalent to 23 nuts… so start counting ? Cacao nibs: These unprocessed crunchy bits of raw cacao are the broken up pieces of the cacao bean. 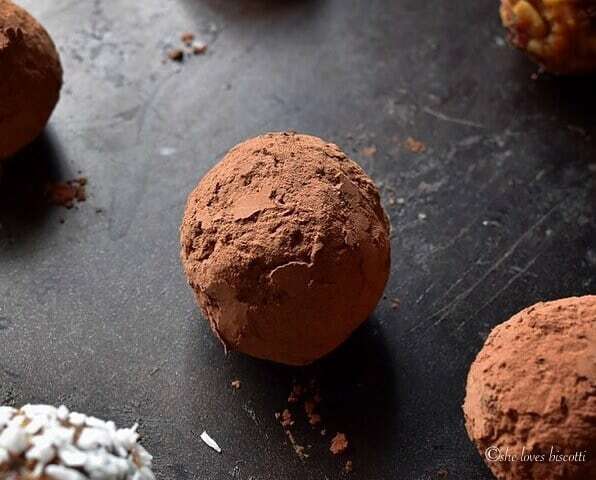 Cacao is considered a super food due to the high levels of the antioxidants flavanols and polyphenols; not to mention that it is one of the best dietary sources of magnesium. Goji Berries: These chewy nutritional jewels, native to China, have traditionally been steeped to obtain a hot beverage. They are available throughout the year in North America in a dried form. They are an excellent source of Vitamins A and C. I will usually purchase my berries in a natural health food store. 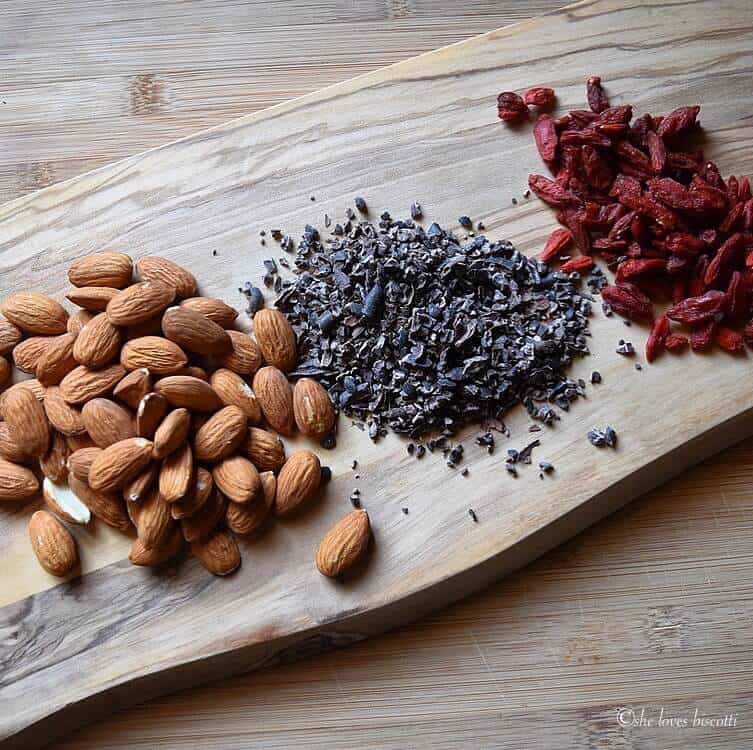 So now that we know the facts about the nutritional benefits of just a few of the ingredients found in these Greek Yogurt Goji Berry Almond Date Energy Bites, let me show you how easily this recipe comes together. 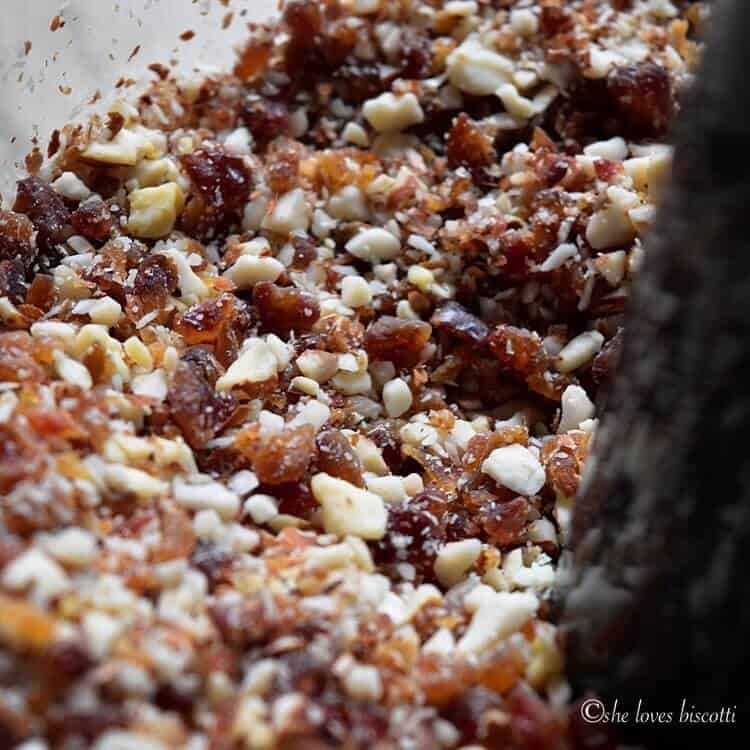 Start by pulsing some dates and almonds in a food processor for about 30 seconds. Add the sunflower seeds, goji berries, cacao nibs, dried cranberries and a pinch of salt and pulse for another 30 seconds or so until your mixture forms a clump. The longer you pulse this mixture, the finer the ingredients will become. Add the yogurt and with one final whirl, you are done; it’s time to dish out some energy bites. Feel free to make smaller or bigger balls. Once the balls are portioned, roll them between the palms of your damp hands. 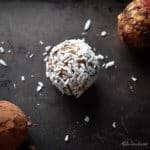 If desired, you can roll these bites in unsweetened shredded coconut or even cocoa. Place them in the refrigerator and then whenever you get a case of the munchies, you are ready! It’s no wonder why there is such an abundance of recipes when it comes to energy and protein bites. 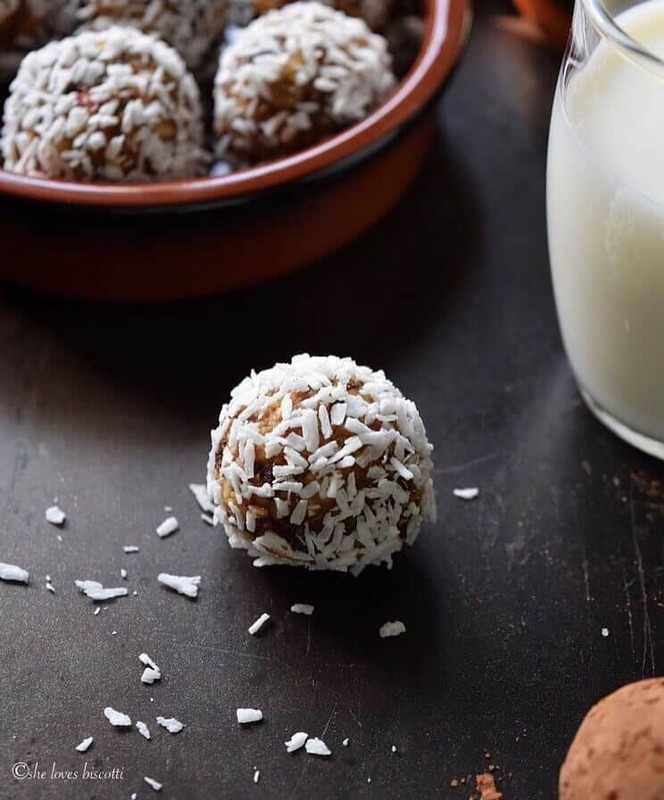 The ingredients are easily interchangeable and there is a lot of nutrition that can be packed in these little power balls. As an added bonus, they are totally adaptable to one’s dietary specifications. Undoubtedly, the perfect snack food and so much healthier than any store bought equivalent. Whoever came up with this original idea was truly a genius. A couple of years ago, I came across this recipe for Yogurt Protein Bites. I liked the idea of incorporating a tart, almost sour taste (in the form of Greek yogurt) to balance out the sweetness of the dates. As an added bonus, the yogurt will contribute to the overall protein content of our little balls of goodness. 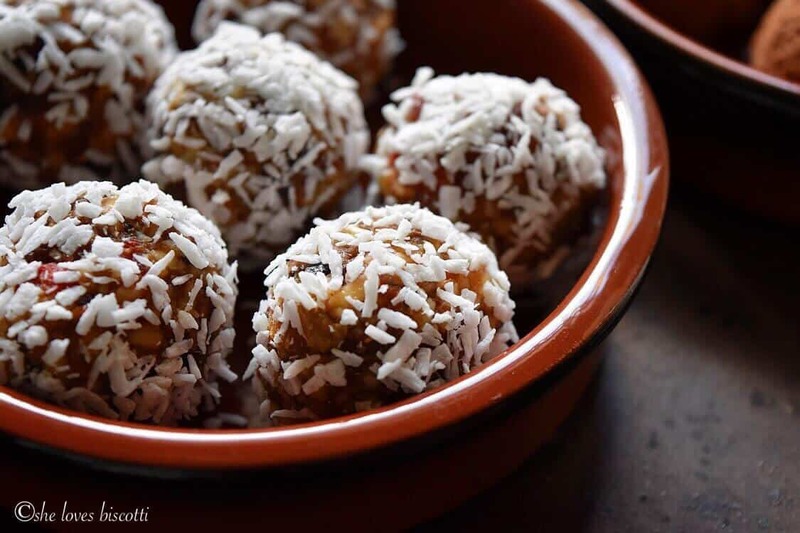 This recipe for these Greek Yogurt Goji Berry Almond Date Energy Bites will quickly become your go-to snack food when you need a quick pick-me-up! Greek Yogurt Goji Berry Almond Date Energy Bites - a healthy snack guaranteed to satisfy the munchies, no matter when that feeling hits! Combine the dates and almonds in a food processor and pulse for about 30 seconds. Add the sunflower seeds, goji berries, cacao nibs, cranberries and salt. Pulse for about 30 seconds or until desired consistency is achieved. Add the yogurt and pulse until incorporated. Shape mixture into 1 inch balls with damp hands. Optional: roll balls in unsweetened shredded coconut or cocoa powder. we chatted in instagram about the exchange of coconut milk yogurt. It worked out fine. Although, mine looked a little to wet so I just chunked some granola with pecans in there there and they’re so delicious. Definitely will remake these. Thank you for the recipe. Fantastic Susan! You have just created a new recipe! Appreciate you taking the time to leave a comment ♥♥♥ Have a great day! I would love to have a few of these just about now! Terrific go too power treat Maria, I am sending the recipe to my college aged daughter. I wouldn’t have thought myself of using Greek yogurt to make energy bites but I love it! Thanks for the recipe!